You are currently browsing the tag archive for the ‘Mormon garments’ tag. 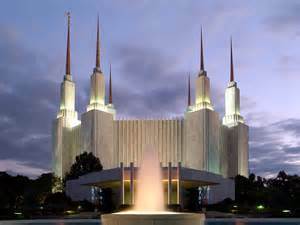 One of the distinguishing features of the Church of Jesus Christ of Latter-day Saints (Mormons) is the temple. The buildings are magnificent and mysterious not only for people who aren’t of the Mormon faith (they are not allowed to enter the temples after the temples are dedicated), but also for members of the faith. As members we are instructed not to share the signs and parts of the ritual that we participate in the endowment portion of the temples and so from that perspective it makes it even more mysterious. Since we are not allowed to share that information, people who haven’t been to the temple yet often feel confused when they do go because the experience is very symbolic and different than what one usually sees in the regular church services. Most of us have a vivid memory of the first time we went to the temple to receive our endowments. I was a newly called missionary and had traveled to the Los Angeles Temple. I did not know what to expect. Although some aspects of my own endowment were wonderfully edifying to me, much of it was confusing. I left bewildered and a little frightened. I have since discovered that my experience was not unique. I have also discovered why my first experience was not all what I had anticipated. At the time, I did not understand the manner in which the Lord teaches His children in His house. Had I understood, my anxiety and confusion would have disappeared, even though my comprehension level might have remained the same. Since the first time I went through the temple, I have been back many times and over the years have become more comfortable with it. There are a number of things that we participate in during what is called the “endowment session” that include signs we make with our hands, clothing we wear, covenants we make, prayers we say, and then passing through the veil of the temple. When I was reading in the Bible recently about Jesus with his chief apostles when he was transfigured, the phrase “endued with power” in Luke 24:49 stood out to me. When I searched for that scripture from an LDS point of view, I found an interesting blog called “LDS Temple Endowment“. The article I read was interesting and shares from their perspective why the LDS temple endowment is Biblical. What was even more interesting to me was a link to an essay published at BYU studies over 30 years ago called “Catholic Liturgy and the Mormon Temple“. It is a 35 page essay that shares various rites in the early Christian church that are very similar to the temple rites found in Mormon temples today. Additionally, it shares pictures of some Catholic cathedrals that have very similar altars and veils that are found in LDS temple endowment rooms. The reason why this is particularly interesting for me is because as LDS, we believe that the Church of Jesus Christ of Latter-day Saints includes ordinances that are not found anymore in any other Christian church today. We believe it is a restoration of the original Christian church that existed right after Jesus established his Church. 1. In the early church there were rituals where both members of the church and non members could participate. There were also rites that only members could participate in. 4. In the very early days, there was a distinguishing between the church and temple. Later on, the two merged into one. 5. Some of the churches and cathedrals still have a veil and an altar. People who participated in the rites passed through the veil and someone on the other side represented the Lord and only their hand was allowed to show to help pull the people through the veil. 6. Part of the wardrobe for men included a cap with a string that attached to their robe. Also, women wore veils. 7. There is a part of the ritual that includes people putting names on the altar and those participating praying for the names on the altar. 8. During the ceremony there is a portion of members of the group repeating words from the priest leading the rite with them standing up and sitting down (this is similar to what I’ve seen as I have participated during Catholic mass). After that prayer is said, the person is endowed with new white garments because the person is considered reborn. 10. People were given a new name. This new name was typically a Saint’s name. Although the rites are not identical, there are enough similarities that it is very interesting to me. Those of you who have been through an LDS temple, will probably relate to a lot of the things that are brought up in the essay as well as the points I brought up. I found it to be very interesting how many similarities there were. I also found it very interesting that Joseph Smith put together the LDS temple endowment without having a very strong understanding of the Catholic church or the history of the early church (as far as I can tell) because it was predominately Protestant where he was raised and lived for most of this lifetime.